(Nanowerk News) A team of researchers from the Universities of Bristol and Sussex in collaboration with Ultrahaptics have built the world's first sonic tractor beam that can lift and move objects using sound waves. Tractor beams are mysterious rays that can grab and lift objects. The concept has been used by science-fiction writers, and programmes like Star Trek, but has since come to fascinate scientists and engineers. Researchers have now built a working tractor beam that uses high-amplitude sound waves to generate an acoustic hologram which can pick up and move small objects. The technique, published in Nature Communications ("Holographic acoustic elements for manipulation of levitated objects"), could be developed for a wide range of applications, for example a sonic production line could transport delicate objects and assemble them, all without physical contact. On the other hand, a miniature version could grip and transport drug capsules or microsurgical instruments through living tissue. Asier Marzo, PhD student and the lead author, said: "It was an incredible experience the first time we saw the object held in place by the tractor beam. All my hard work has paid off, it's brilliant." Bruce Drinkwater, Professor of Ultrasonics in the University of Bristol's Department of Mechanical Engineering, added: "We all know that sound waves can have a physical effect. But here we have managed to control the sound to a degree never previously achieved." Sriram Subramanian, Professor of Informatics at the University of Sussex and co-founder of Ultrahaptics, explained: "In our device we manipulate objects in mid-air and seemingly defy gravity. Here we individually control dozens of loudspeakers to tell us an optimal solution to generate an acoustic hologram that can manipulate multiple objects in real-time without contact." 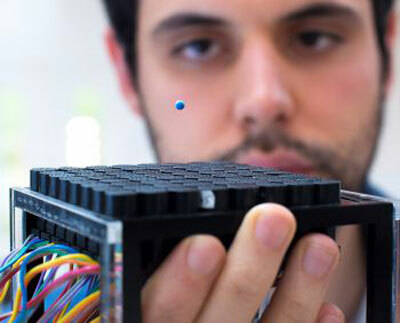 Asier Marzo, PHD student and lead author, levitating a polystyrene ball with soundwaves. The researchers used an array of 64 miniature loudspeakers to create high-pitch and high-intensity sound waves. The tractor beam works by surrounding the object with high-intensity sound and this creates a force field that keeps the objects in place. By carefully controlling the output of the loudspeakers the object can be either held in place, moved or rotated. The team have shown that three different shapes of acoustic force fields work as tractor beams. The first is an acoustic force field that resembles a pair of fingers or tweezers. The second is an acoustic vortex, the objects becoming stuck-in and then trapped at the core and the third is best described as a high-intensity cage that surrounds the objects and holds them in place from all directions. Previous work on acoustic studies had to surround the object with loudspeakers, which limits the extent of movement and restricts many applications. 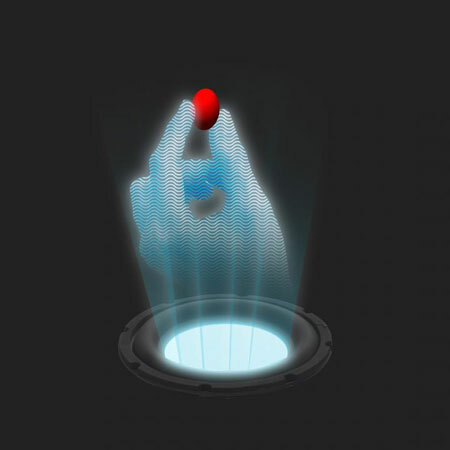 Last year, the University of Dundee presented the concept of a tractor beam but no objects were held in the ray.